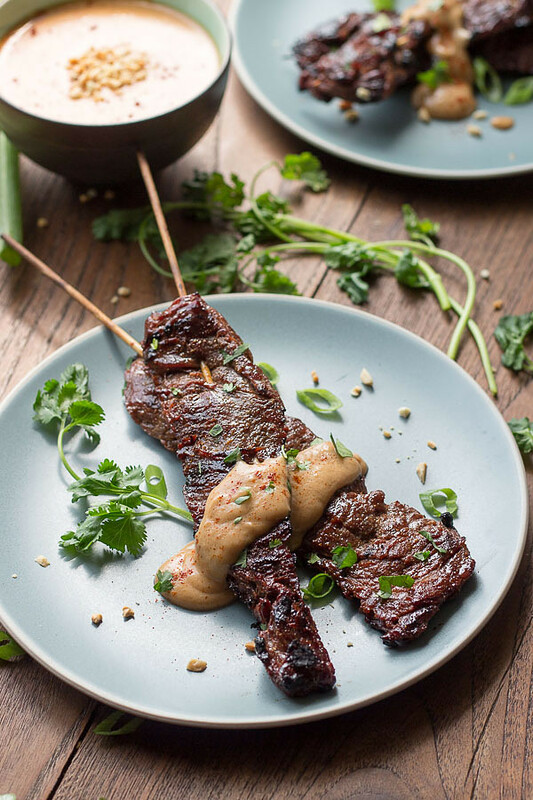 An easy and authentic tasting Beef Satay recipe featuring beef in a Thai marinade and a tasty peanut sauce. Perfect served with a Thai cucumber salad. Low carb eating at it best! Wow! I can’t believe that my kids go back to school on Wednesday. I blinked and missed their Summer break. Soon we’ll be knee-deep in homework and extra-curricular activities with little time left for making dinner during the week. Luckily, I have some quick-dinner-tricks up my sleeve and a few recipes that give you that restaurant taste you crave, without breaking the bank. 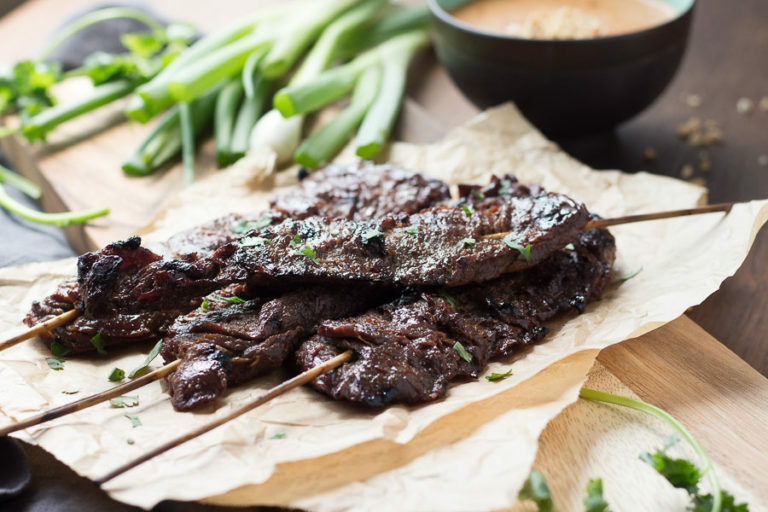 This beef satay recipe is perfect for a week night meal – especially if you have a crazy hectic life! The whole thing preps and cooks faster than you can order take-out, pick it up, and bring it home. The beef only needs 15-20 minutes to marinate before it’s grilled, leaving plenty of time to make the peanut sauce and even a beautiful Thai cucumber salad. The whole meal is ready in 30 minutes and tastes like the real deal. INGREDIENTS: For this recipe beef satay, I used 4 grass-fed beef satay that arrived in my Butcher Box shipment. The meat was really beautiful – I was impressed, but you can use flank steak or skirt steak. You want a meat that has some “grain” for that authentic look. I also used Red Boat Fish Sauce and Mae Ploy Thai Red Curry Paste as well as Tamari – a gluten-free soy sauce. I like Red Boat Fish Sauce because it is gluten-free and produced in small batches using traditional methods — it’s also Paleo and my favorite. Three Crabs brand is also a good fish sauce but I don’t know if it is gluten-free. In a pinch, the Thai Kitchen fish sauce from the grocery store (in the Asian section) is just fine and is available in a much smaller bottle. Find Chile Garlic Sauce in the Asian section of the grocery store — it’s wonderful! I absolutely love the stuff. It’s used in many Asian recipes from Chinese, to Vietnamese, to Thai, to Fusion recipes. Add a little of this flavorful sauce to mayo and you have a great condiment. If you don’t have any Thai curry paste and you enjoy Thai food, you need to get at least one. I love the Mae Ploy brand and have the Yellow Curry Paste (mild), Green Curry Paste (spicy), Red Curry Paste (medium-spicy), Panang Curry Paste (mild), and Massaman Curry Paste (mild). Yep, I have them all and I use them! They keep forever in the fridge. I’ve had mine for over a year and they are still great. If you are looking for one or two curry pastes to try, get the Yellow and Red or Panang. They are the most versatile. That’s it folks. It’s a super simple recipe that your family won’t know is low carb (keto) or sugar-free. Enjoy! 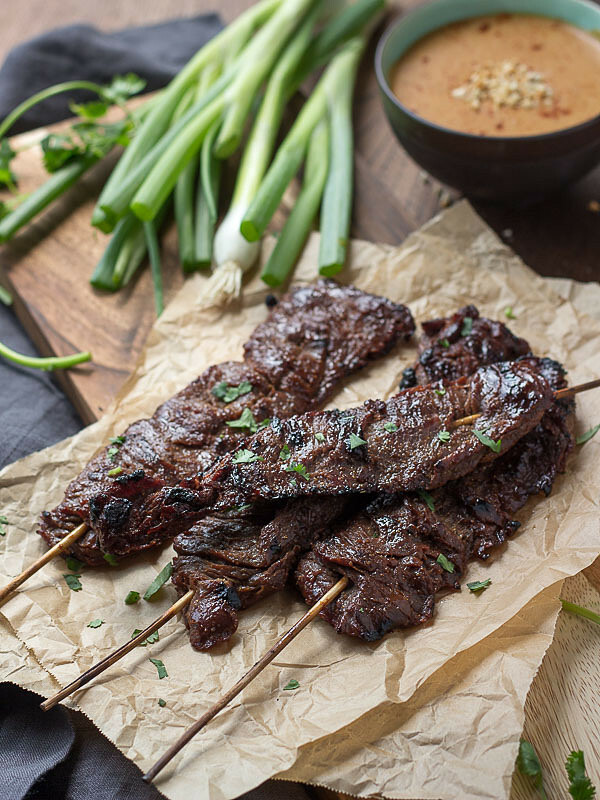 This delicious Beef Satay and Peanut Sauce is 3 carbs per serving. 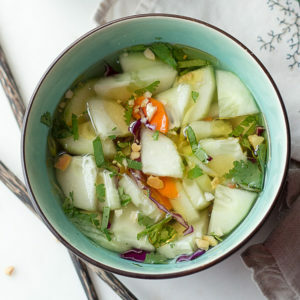 With the Thai Cucumber Salad it’s 7 net carbs. 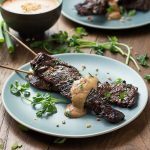 An easy and authentic tasting Beef Satay recipe featuring beef in a Thai marinade and a tasty peanut sauce. 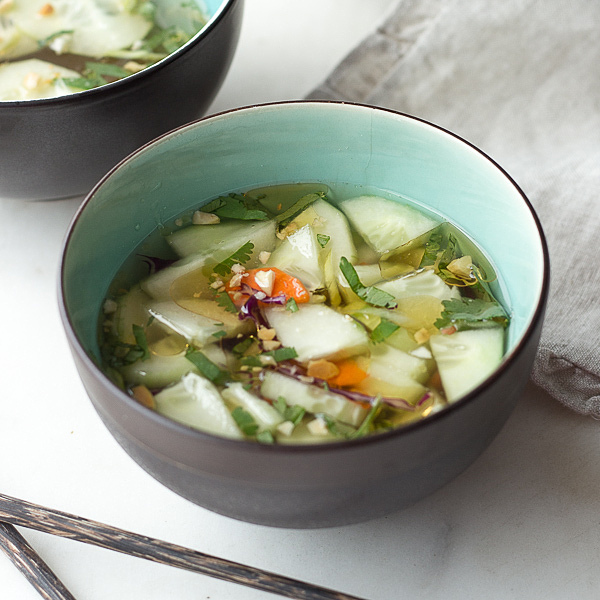 Perfect served with a Thai cucumber salad. This 30 minute meal is low carb eating at it best! Preparation: Get your ingredients together. Powder the 3 T of Sukrin Gold if using. 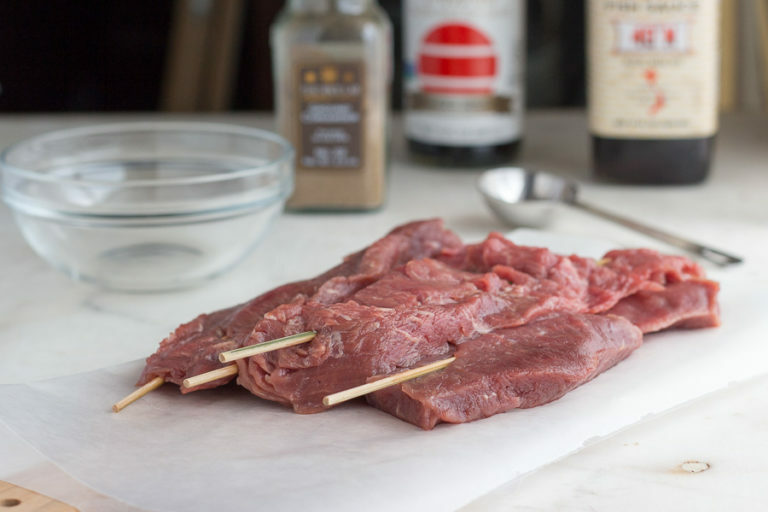 Beef Satay: Cut the flank steak into 1 1/2 inch strips so that the grain of the meat is going horizontally across the strip. Stick the skewers into the meat leaving a handle long enough to hold while eating. Mix the fish sauce, soy sauce, and sweetener together in a baking dish and make sure to coat all surfaces of the beef. Sprinkle the meat with the coriander, rubbing it in. Let marinate for about 15-20 minutes. Meanwhile, shake the can of coconut milk, preheat grill, and start on the peanut sauce. Thai Peanut Sauce: In a smallish microwave safe bowl, warm the peanut butter up in the microwave for a few seconds. Stir in the chile garlic sauce, sweetener of your choice, and Thai red curry paste. I use a small whisk. Slowly add the coconut milk to the peanut butter mixture while stirring with a whisk. Optional: If you are making the cucumber salad mentioned in the post, do so now. Grill: Pour about 1 tablespoon of oil over the beef and coat all surfaces. Fold a piece of foil in half to be placed under the handles of the skewers while cooking on the grill. Remove the beef from the marinade and place it on the grill for cooking. Line them up and place the foil under the handles. Grill on both sides until done - this depends on how thick your meat is and how hot your grill gets. Serve: Serve the beef satay with a Thai cucumber salad, Thai Chicken Coconut Soup or a regular salad with your favorite Asian dressing. Hi this looks amazing! Is there a substitute for peanuts as I am highly allergic. I can have other nuts except cashews do you have a suggestion for another nut or sauce that I could use instead? Thank you! This recipe was amazing! Love loved the sauce!!! The prep took a little longer than posted but was well worth it!! We used a thin cut round tip used for chip beef because it was a bit cheaper and still turned out amazing! I cannot find sukran gold ir coconut sugar, can i sun with raw brown sugar or skip it all together? Is there any way I can make this without a grill? Maybe bake it on a “grillpan”? This was an EXCELLENT recipe. We have already returned to the grocer and purchased a larger skirt steak so we can have more next time. Oh, and I drank the dressing on the cucumber salad. Perfectly Amazingly delicious. It’s winter and raining … can I cook this under the broiler? This looks awesome! I’m always on the lookout for grilling recipes! Satay sauce is my favorite! I have only had it with chicken, but can’t wait to try it with beef! The summer always flies by! School doesn’t start here until after Labor Day so we have a few more weeks but I think every day is already planned with something! I love these beef satays. They look really delicious and so full of flavor!